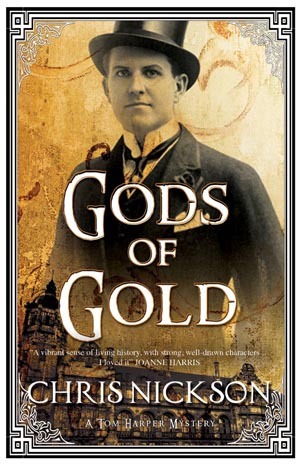 My new book, Gods of Gold, is published in the UK on August 28th. Yes, I’d like you to buy it, of course I would, don’t silly. To give you a little inducement, here’s a taster, a teaser, the opening. It’s set in 1890, against the backdrop of the Leeds Gas Strike, and features Detective Inspector Tom Harper of Leeds Police. Tom Harper pounded down Briggate, the hobnails from his boots scattering sparks behind him. He pushed between people, not even hearing their complaints as he ran on, eyes fixed on the man he was pursuing, leaping over a small dog that tried to snap at his ankles. They didn’t, of course they didn’t, but at least they parted to let him through. At Duncan Street, under the Yorkshire Relish sign, he slid between a cart and a tram that was turning the corner. His foot slipped on a pile of horse dung and he drew in his breath sharply, the moment hanging. Then the sole gripped and he was running again. Harper ducked in front of a hackney carriage, steadying himself with a hand on the horse’s neck. He felt its breath hot against his cheek for a second, then plunged on. He was fast but the man in front was even faster, stretching the distance between them. His lungs were burning. Without even thinking, he glanced across at the clock on the Ball-Dyson building. Half past eleven. He forced his feet down harder, arms pumping like a harrier. As they reached Leeds Bridge the man leapt into the road, weaving between the traffic. Harper followed him, squeezing sideways between a pair of omnibuses, seeing the passengers stare down at him in astonishment through the window. Then he was free again, rushing past the row of small shops and watching the man disappear round the corner on to Dock Street. By the time he arrived the street was empty. He stood, panting heavily, holding on to the gas lamp on the corner, unable to believe his eyes. The man had simply vanished. There was nothing, not even the sound of footsteps. Off to his left, a cluster of warehouses ran down to the river. Across the road the chimneys of the paper mill belched their stink into the air. Where had the bugger gone? Harper had been up at Hope Brothers on Briggate, barely listening as the manager described a shoplifter. The man’s mouth frowned prissily as he talked and rearranged a display of bonnets on a table. Outside, the shop boy was lowering the canvas awning against the June sun. Harper scribbled a word or two in his notebook. It should be the beat bobby doing this, he thought. He was a detective inspector; his time was more valuable than this. But one of the Hopes lived next door to the new chief constable. A word or two and the superintendent had sent him down here with an apologetic shrug of his shoulders. That was all he needed. Inspector Harper began to run. He tipped the hat back and wiped the sweat off his forehead. The air was sultry, hot with the start of summer. Where was the sod? He could be hiding just a few yards away or already off beyond a wall and clear away in Hunslet. One thing was certain: Harper wasn’t going to find him. He straightened his jacket and turned around. What a bloody waste of a morning. He’d wanted to be a policeman as long as he could remember. When he was a nipper, no more than a toddler, he’d often follow Constable Hardwick, the beat bobby, down their street in the Leylands, just north of the city centre, imitating the man’s waddling walk and nods at the women gathered on their doorsteps. To him, the decision to join the force was made there and then. He didn’t need to think about it again. But that certainty shattered when he was nine. Suddenly his schooldays had ended, like every other boy and girl he knew. His father found him work at Brunswick’s brewery, rolling barrels, full and empty, twelve hours a day and Saturday mornings, his pay going straight to his mam. Each evening he’d trudge home, so tired he could barely stay awake for supper. It took two years for his ambition to rekindle. He’d been sent on an errand that took him past Millgarth police station, and saw two bobbies escorting a prisoner in handcuffs. The desire all came back then, stronger than ever, the thought that he could do something more than use his muscles for the rest of his life. He joined the public library, wary at first in case they wouldn’t let someone like him borrow books. From there he spent his free hours reading; novels, politics, history, he’d roared through them all. Books took him away and showed him the world beyond the end of the road. The only pity was that he didn’t have time for books any longer. He’d laboured at his penmanship, practising over and over until he could manage a fair, legible hand. Then, the day he turned nineteen, he’d applied to join the force, certain they wouldn’t turn him down. He’d been proud then; he’d loved walking the beat, each part of the job. He learned every day. But he was happier still when he was finally able to move into plain clothes. That was real policing, he’d concluded. He’d done well, too, climbing from detective constable to sergeant and then to inspector before he was thirty. And now he was chasing bloody pickpockets down Briggate. He might as well be back in uniform.